Morihei Ueshiba (O-Sensei) spent much of his life studying various martial and spiritual disciplines. This included Daito Ryu Ju-jutsu as well as several classical weapon systems. These years of training culminated in the development of aikido. 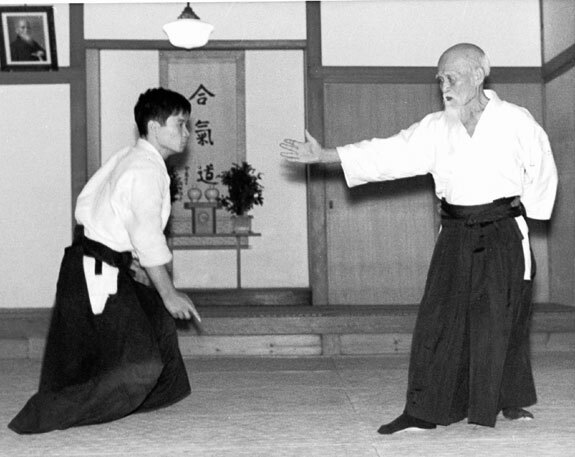 Morihei Ueshiba became dissatisfied with the conflictive nature of many martial arts and believed that in true budo, there should be no opponent or struggle. He believed one should seek to harmonise with the world around and that this concept could be expressed physically through the techniques of aikido. Aikido is not a sport and therefore has no competition. Aikido is a modern japanese budo; aspects of the training such as the dojo etiquette and weapons training give aikido training its distinctive flavour and distinguish the training from a modern gym or self-defence class.